Eric Harris turned around north towards where they were standing around 11:35am and shot Daniel Mauser at close range. Witnesses say that Eric made a comment to Daniel about his glasses before he shot him. Eric then joined Dylan at another table where three other students were hiding, they shot underneath the table and wounded two of the students and killed the other, that student was Corey DePooter who was just 17 years old. Both Eric and Dylan then walked towards the administration desk. Eric threw a Molotov Cocktail but it didn't explode. They spotted a student who had previously been injured and had moved to another area of the library. They began to harass the student, joking about killing him but then they decided to leave him alone. They decided they were going to leave the library and go down to the cafeteria (The Commons). Eric started walking out of the library but Dylan decided to do a few things before he left. He pointed his gun towards the staff break room and shot at a television, he then slammed a chair really hard on top of the computer terminal that was on the desk where Patti Nielson was hiding underneath. They were both reported to have left the library at 11:36am. The 911 operator was still on the phone with Patti Nielson. As soon as it looked like Dylan and Eric were out of the library, Patti told the operator that she had to go and quickly moved into the library's staff break room to hide inside a cupboard. Three of Patti's colleagues had been hiding elsewhere, two in the television studio and the other one in the periodicals room. Patti and her colleagues would remain in their hiding places till the SWAT team came into the building at 3:30pm to evacuate them. During this time, a deputy spotted a man on the roof of the school building. They thought at first that this could possibly be a third shooter but it turned out to be a repair man who happened to be working on the roof that morning and when he heard the shots, he tried to clamp the door to the roof shut and hide as much as he could for fear of being shot. For those still left in the library after Eric and Dylan left, they described the scene to be horrific, completely on edge, people were moaning in pain and their ears were ringing with the constant noise of the alarms going off. people were scared to move for fear of the killers coming back and people were wondering where the police were and why wasn't help coming. Some students decided to make a run for it knowing that there was a possibility Eric and Dylan could come back at any moment, they took the risk and managed to escape through the northern emergency exit that opened out onto the sidewalk. They moved as fast as they could and hid behind one of the police cars. They told the police that the shooters had left the library but they didn't know if they were going to come back. By the time that Dylan Klebold and Eric Harris had left the library, 12 students were dead, Teacher Dave Sanders was still in a classroom with some other students who were trying to keep him conscious and stop his blood loss. The students were trying to get through to 911. One of the students got through to his father and he helped by giving instructions over the phone. One of the students also put a sign up at the window ''1 Bleeding To Death'' but nobody responded. There was also students who were seriously injured. In the 7 minutes that Eric and Dylan were in the library, they killed 10 people and injured 12. The total number of people in the library that day was 56. 34 were unharmed but clearly traumatised by what had happened. The investigators later said that Dylan and Eric had more than enough ammo to kill more people but for some reason they decided not to, some people think that they were still hoping that the bombs could work or that they grew tired and gave up. Dylan and Eric walked passed a few of the locked classrooms as they made their way to the cafeteria and witnesses say that they looked into the windows in the classroom doors and made eye contact with some of the students. They didn't fire their guns or make any sudden actions. The witnesses in the classrooms were terrified because they thought that they could fire at them at any moment but they seemed to be uninterested at this point and carried on walking. At around 11:38am from the official timeline and from CCTV footage from inside the school, Eric and Dylan threw some pipe bombs down to the cafeteria. They threw a pipe bomb into one of the storage rooms but luckily nobody was in there. Witnesses say that they saw them shoot into some of the empty classrooms and that they taped a Molotov Cocktail to a storage room door (which was next to the classroom where Dave Sanders and the students were hiding). The Molotov Cocktail did go off and caused a small fire which was quickly put out by a teacher when Eric and Dylan had left the area. The CCTV cameras caught Dylan and Eric at 11:44am on the stairs leading down to the cafeteria (I tried to find a clip of this moment on Youtube but they've removed it. You can find it elsewhere online but I did find the full CCTV from that morning which is over 3 hours long. If you're interesting in viewing it, you can see it here) where Eric knelt down and tried to fire a few shots at one of the duffel bags containing the propane bomb when this failed to do anything, Dylan walked over to the bomb and it's unclear what he was trying to do, possibly tamper with it but it didn't work either. A witness who was still in the cafeteria at this time said that he overheard one of them saying ''Today the world's going to come to an end. Today is the day we die''. Some people think that the reason they went to the cafeteria and shot at the propane bomb was their first attempt at suicide. If the bomb had exploded it would have destroyed the cafeteria and taken the library and everyone who was still in there with it as the library was located above the cafeteria. After the failure to get the bomb to explode, they were seen looking across the cafeteria as if wondering what to do next as well as drinking from cups that students had left behind on the tables. Dylan was seen to light what looked like a pipe bomb and threw it towards the bomb in another attempt to make it go off. The camera showed a fire as they both walked back up the stairs (there was an explosion, possibly from the pipe bomb Dylan threw igniting some of the flammable liquids that were said to be attached to one of the bombs, this took out the cafeteria windows and activated the sprinklers, The two propane bombs still didn't explode) at 11:46am. Eric and Dylan (11:49am) were seen walking towards the main office area of the school where an unarmed security guard and secretary were hiding, both were on the phone with 911 operators. The SWAT team arrived outside of the school. The Jefferson County Undersheriff John Dunaway arrived at the command post and gave the go ahead for the SWAT team to now enter the school. At 11:53am, Eric and Dylan moved from the main office areas to the art hall, they fired their guns into the ceiling as they were walking. At 11:56am they returned to the cafeteria again and from the camera footage, they are seen to be looking tired, fed up and frustrated that the bombs hadn't gone off and the fire was now being put out by the sprinkler system. 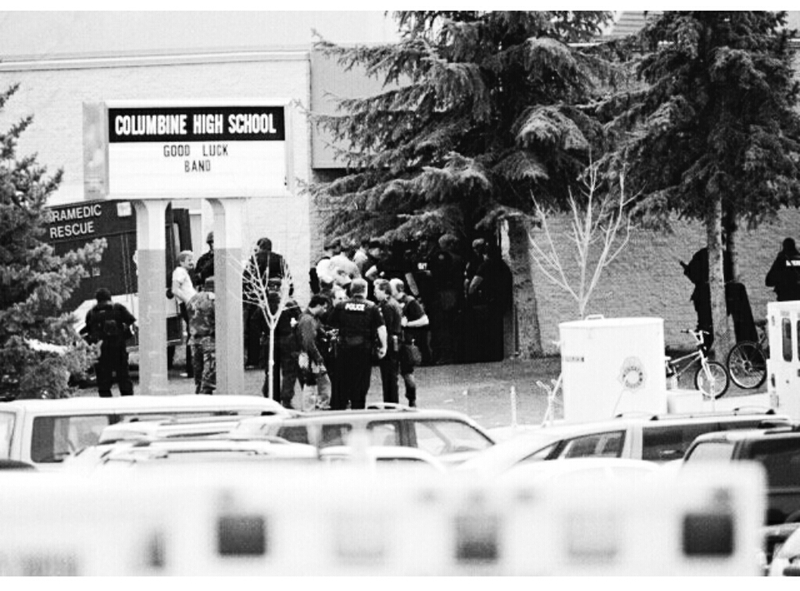 It was around this time that TV stations both locally and around the world were reporting that there was an active shooting going on at Columbine High School. From 12:02 to 12:05pm Dylan and Eric were back in the library which was covered in thick smoke. They made another last attempt at a shoot out with police through the broken windows of the library (the police were said to be going through the school at this moment, from classroom to classroom and the 6 SWAT team members were just about to enter the school), one theory around this is that they were hoping to be killed in the process. Officers outside returned fire to keep Dylan and Eric distracted whilst other officers worked on rescue procedures and other members of the SWAT team were watching from roofs of nearby houses. A few of the ambulances left containing some of the injured students. It was reported that the only people that were alive at that point in the library were Patrick Ireland, Lisa Kreutz and the four members of teaching staff including Patti Nielson. Dylan Klebold and Eric Harris had committed suicide in the library a few feet away from some of their victims. Investigators believe it was shortly after the shoot out with police that they took their own lives by gunshot. Patti and the other witnesses said that they couldn't tell when they killed themselves because of the smoke and all of the noise with the alarms. At 12:08pm a smoke alarm in the library went off where Dylan and Eric's bodies were later found. A Molotov Cocktail was found on a table near to their bodies which had been placed there by one of them, it didn't cause an explosion but there was a small fire. Chaos continued outside the school with police and emergency services trying to deal with injured students and getting people to the local hospitals as soon as possible. More of the media were there and frantic parents had turned up too. The SWAT team and police were in the school building proceeding with caution because they were unsure at this point if there was any more bombs hidden around the school. The SWAT team were informed of the sign and the room that Dave Sanders and the students were in and they were told that a bloody rag would be on the door handle of the classroom. The SWAT team and police thought that the school was still under siege and as a result resources were delayed for up to 3 hours. Despite the amazing efforts of the students to save Dave Sanders, he sadly passed away. During his last moments, one of the students tending to him took some of the family pictures from Dave's wallet and talked to Dave about his family in an attempt to keep him conscious and take his mind off of the pain. His last words were said to be ''Tell my family I love them''. I'll be talking more about the victims of this horrific event, The Basement Tapes, Dylan and Eric and the aftermath in my next few posts.